How is the year ahead 2017 going to be ? As the sun dawns to mark the beginning of a new year, you must be keen to know what is in store for you in the year ahead 2017. Get your personal predictions for the year 2017 by Pt. Vvidhushekhor Pandey & Dr. (Pt.) Aaadietya Pandey. Predictions for the Year 2017 will briefly include all the following aspects of your life. 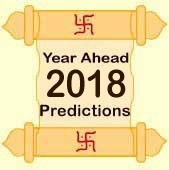 In this report Pandit ji will unveil the secrets hidden for you in the year 2017. Remedies will also be suggested/recommended where ever necessary. Over an above this, two specific questions will also be answered for free in this report.